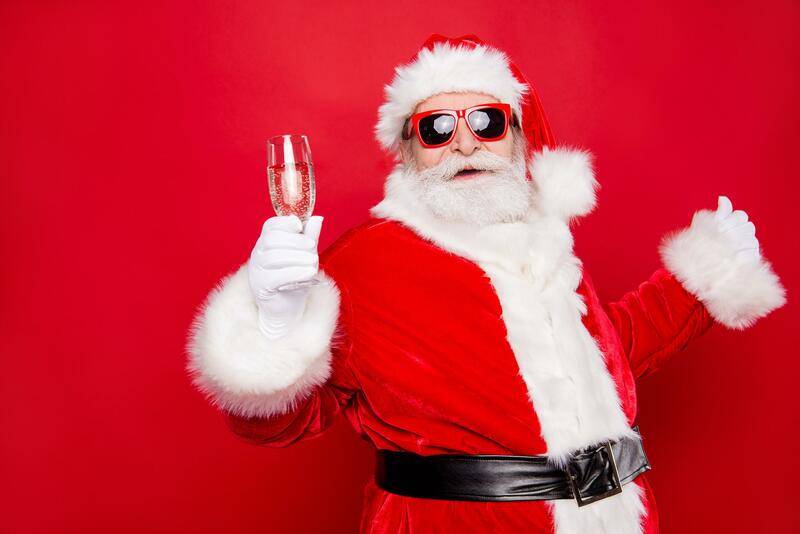 When he's not delivering presents or gorging himself on milk and cookies, Santa can be sometimes be found slinging back champagne (or mimosas) at brunch. 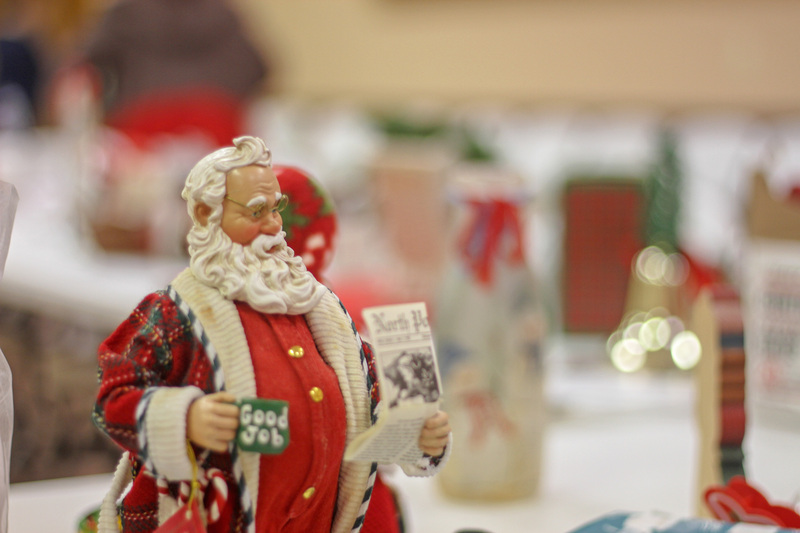 [bottom right] The Erie Free Store's Santa Shop, in very un-Scrooge-like fashion, will feature a variety of charitably donated ornaments, decorations, and other goods. Spontaneity has its charms, but nothing says holiday magic like obsessively plotting your life down to the millisecond. Well, you're in luck, boys and girls, because we here at the Reader are about to help you light up your day planners like a regular Clark "Grids"wold. You'd better hope for some orthotics in your shoes this St. Nicholas Day, because there is a bustle of activity to keep up with these next few weeks. But if Santa can do it, so can you. (For those with pedometers, Erie is 3,316 miles south of the North Pole, or 7.5 million steps — so your benchmark is set). If you're going to go the distance, you're going to need the fuel. Say "Happy Hollandaise" with a broad selection of breakfasts and brunches with Santa. On Comet, on Cupid, on Donuts and Blintzes! Playing Santa's helper this year but fearing for your roof's structural integrity? A couple of cookies won't weigh you down too much (just don't binge during your Hallmark movie marathons). Better yet, take your kids out on the town to eat them in front of you. Parenting is about sacrifice. BONUS: Many of these activities feature crafts, party favors, and/or photo ops with the big guy himself! For more details (or links to more details), it's always worth sniffing around the Erie Reader's extensive online database at eriereader.com/calendar. Showing up to and supporting as many of these events as possible means you will need to become the model of efficiency. Outside of owning a flux capacitor, one of the best ways to master time management is in the kitchen. 12/6: The Whole Foods Co-Op (1341 W. 26th St.) will be hosting a Slow Cooker Class with an emphasis on immune-boosting meals at 6 p.m. Take care of yourself (and your errands) while dinner takes care of itself in the Crockpot. 12/11: Or take the pressure off yourself with LifeWorks Erie's (406 Peach St.) No-Pressure Holiday Pressure Cooking demonstration, hosted by VeganCheers' Lisa Rose from 2 to 3:30 p.m. Need a bit of liquid encouragement to propel you into the holiday spirit? 12/5: Never fear — unless the goat-demon Krampus is out and about, as he will for Krampusnacht at Jekyll & Hyde's (8 E. 10th St.) and other watering holes around downtown Erie, spanking bar-goers for their sins (unless, perhaps, you buy him a shot). 12/8: Imbibe with a clearer conscience at the Santa Bar Crawl, beginning at the Bourbon Barrel (1213 State St.) from 3 to 6 p.m., before hitting Docksider (6 to 8 p.m.), Big Bar (8 to 10 p.m.), and wrapping up at Resolution Nightclub (10 p.m. to 2 a.m.) Only two stipulations — all merrymaking must be done in uniform (regulation red-and-white) and a $10 donation or unwrapped toy is asked of each Santa, both for verisimilitude and to benefit the children of the Sarah Reed Children's Center. 12/8: A more relaxed (but still formal) dress code accompanies the annual Barber Christmas Ball at the Bayfront Convention Center (1 Sassafras Pier), benefiting the children and adults with intellectual and/or developmental disabilities, per the Barber National Institute's mission. Each ticket includes hors d'oeuvres, dessert, soft drinks, and two complimentary cocktails (a cash bar is also available). It's always important to dress warm this time of year, but it's even more imperative to dress ugly. Hideously woven from the threads of '70s and '80s nostalgia, tacky fashion has been elevated to savvy fashion with the rise of the "ugly sweater party." In the event your friends are too cold and humorless to invite you to one of their own, these venues are ready to welcome you into their wooly, putridly-patterned arms. 12/7: Dramashop (1001 State St., Ste. 210) is hosting the third iteration of their Ugly Sweater Holiday Party, running concurrently (but unconnected) with the year's final Gallery Night from 7 to 10 p.m. Snacks and entertainment provided. 12/15: Join the Jesse James Weston Trio at the Mound Grove Golf Course Clubhouse (10760 Donation Rd., Waterford, PA 16441) for their Ugly Christmas Sweater and Rock and Roll Extravaganza. Rock around the Christmas tree — or rock with a Christmas tree around you, blinking lights and all — it matters not. Just rock. 12/19: The Plymouth Tavern (1109 State St.) will offer prize giveaways for the cringiest attire at their Ugly Sweater Party, kicking off at 9 p.m.
Picture this: your neighbors have had their lights up since the day after Halloween. Their stockings have been hung by the chimney with care since Thanksgiving and their shopping lists have been made, checked out, and checked over twice. In stark contrast, your home is more "30 Days in the Hole" than storybook North Pole. Don't you just resent them even the tiniest bit? If you're experiencing these feelings, it could be that you're what psychiatric experts call "repressed festive as fudge" (omitting the "f-dash-dash-dash" word here to avoid soap poisoning). Take the wire cutters to the barbed wire fence around your soul and liberate the industrious elf inside with these events. 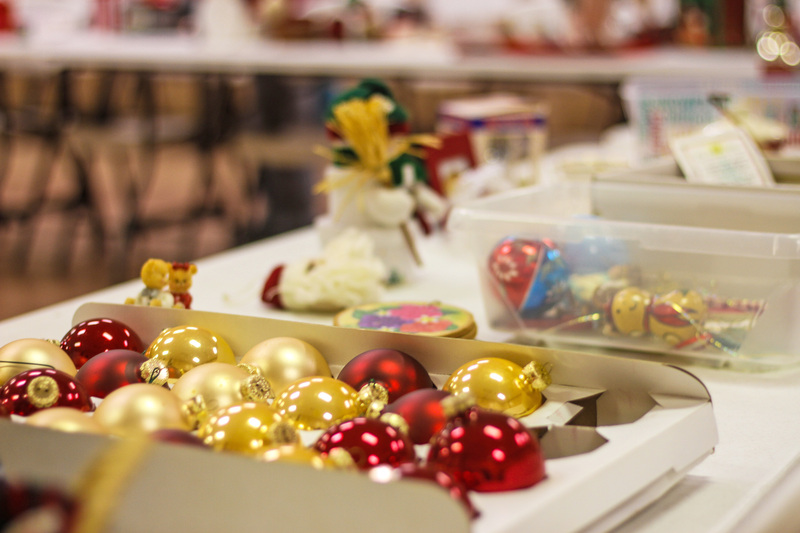 12/8: Children can harness their holiday spirit animals (or interact with live examples from the Erie Zoo and Tamarack Wildlife Rehabilitation Center), bedazzle cookies with the Erie Kiwanis Club, and create accessories for your mantelpiece at the Tom Ridge Environmental Center's (301 Peninsula Dr.) TREC the Halls, with activities beginning at 10 a.m. Revisit the TREC on Dec. 9 from 2 to 3:30 p.m. for a Beach Glass Ornament Workshop or on Dec. 15 for a Natural Ornament Workshop from 1 to 3 p.m.
12/8: Family is the clay that holds us together, especially at the latest iteration of the Erie ClaySpace Family Workshop (1505 State St., 3rd Floor), where parent-and-child pairs will collaborate on holiday-themed slab projects from 2 to 3:30 p.m.
12/11 and 12/18: Claytopia (924 W. Plaza Dr.) is not one to screw the pooch (or their parents), offering Tuesday appointments (between 10 a.m. and 2 p.m.) to create paw print ornaments with your pup. Studies show that inner elves also respond well to retail therapy. In case you missed our previous "Shop Local" issue, here are a few pop-ups you can peruse during this season of Yule. 12/5, 12/12, and 12/19: Ember + Forge (401 State St.) will host Boutique Nights on Wednesdays from 4 to 6 p.m. through Christmas. 12/7: Blossom's Clay Studio (138 E. 26th St.) will hold a Holiday Art Show & Sale from 11 a.m. to 8 p.m.
12/7 and 12/8: The WLD Ranch (7351 Woolsey Rd., Girard, PA 16417) is operating its Kids' Christmas Shop for two days (Saturday 4 to 8 p.m. and Sunday 10 a.m. to 2 p.m.) With prices topping out at $10, it's friendly on an amateur driveway shoveler's budget. 12/7: The Palace Hardware Building (915 State St.) will house the Palace Holiday Market from 4 to 10 p.m. featuring handmade gifts (and gift cards) from Erie's own. Dutifully adhered to all the consumerist protocols and still can't get in the yuletide mood? Perhaps you just need to relax and let it happen. Lights, dancing, and music are all known Santadisiacs — stimulate your senses and get excited for the season again. 12/5 and 12/8: The voices of the Mercyhurst Concert Choir join in angelic harmony for two performances of "A Storybook Christmas," the first (Wednesday at 7 p.m.) at St. Mary's Chapel in North East (48 N. Pearl St., North East, PA 16428) and the second (Sunday at 4 p.m.) at the Mary D'Angelo Performing Arts Center (501 E. 38th St.) in tandem with the Mercyhurst Civic Orchestra. 12/10: Even if you do not own a single Hawaiian shirt or pair of fitted Capri shorts, you're probably familiar with the sun-drenched, carefree sounds of Jimmy Buffett. Making his way to Bethlehem via Margaritaville is longtime Parrothead guitarist Peter Mayer with Stars and Promises. Drawing from a variety of genres, Mayer's Christmas outfit hopes to be the lost shaker of salt to melt your icy disposition on Dec. 10 at First Alliance Church (2939 Zimmerly Rd. ), beginning at 7 p.m.
12/20: Speaking of standbys, how about catching A Very (The) Standby Christmas at PACA (1505 State St.) on Dec. 20, presented by the Andromeda Agency? The headliners' energetic brand of emo-indie will provide an alternate take on your holiday favorites, and perhaps resuscitate your run-over-by-a-reindeer feels. Doors open at 7:30 p.m.
12/7: Witness Perry Square Park illuminated in full glory as Downtown D'Lights kicks off at 5 p.m. Free hot chocolate and horse-drawn carriage rides will be available throughout the night (as well as photo ops with Mr. and Mrs. Claus at the Boston Store). 12/8: What's more powerful than a locomotive? A massive display of miniature trains evoking memories of Christmas past. The Lakeshore Model Railroad Association presents its Third Annual Open House from 10 a.m. to 4 p.m. at Eastminster Presbyterian Church, 2320 E. Lake Rd. 12/13 and 12/14: Yes, joy and cheer are available in drive-thru format, for less than the cost of a Crunchwrap Supreme, at Erie First Assembly's Christmas Town (8150 Oliver Rd.) Enjoy charming displays and light shows after 6 p.m. absolutely free of charge. 12/14 - 12/16: Take a walk through Asbury Woods' Winter Wonderland, a quarter mile of synchronized lights and music winding through one of the best pockets of nature the Erie area has to offer (for more details, see our Spotlights section).